Steve Somers presents his Arctic Express program at Unioni Hill School Wednesday, aided here by student Kelvon Hursey, who portrayed the sun during his part in the skit. High Point – Union Hill Elementary students took a magic train ride Wednesday to learn how different holidays are celebrated around the world. With a sprinkle of magic snow, colorful books, holiday music and storytelling, “train conductor” Steve Somers took youngsters on the Arctic Express – a journey to the worlds most popular winter celebrations, including holidays like Diwali (a Hindu festival) and the Chinese New Year. Somers used a number of props to demonstrate such holidays as the African themed Kwanzaa celebration and the Jewish celebration of Hanukkah, which begins Friday. Students also learned about the changing of the seasons, particularly winter solstice. Somers said audience participation is one creative way to grab the attention of young children. One youngster donned a sun outfit to help Somers, who calls himself the Amazing Teacher, demonstrate what happens during winter solstice. Somers a High Point-based educator, mixed entertainment and education during the special program Wednesday morning. A major part of Somers’ Arctic Express program is getting children to discover the importance of giving and sharing during the holidays. He gets a kick out of interacting with kids and seeing their “faces light up.” Union Hill students did just that when Somers’ pet rabbit, Snowball – hidden from view – “magically” appeared. “It’s a real one.” one youngster exclaimed as his classmates squealed with excitement. 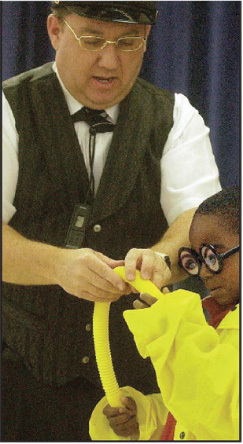 The veteran educator does a variety of educational programs through the school year.